It all starts quite blandly, and to top that, quite abruptly as well. The power button is pushed and without warning this dull, black screen jumps on to your television. No music. No playful sounds. The game’s title written in giant, yellow text. That is all you are given. 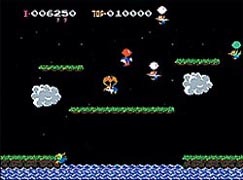 Little do you realize that this nightmare of an introduction could be the beginning to one of the most action-packed and furthermore exciting games on the Nintendo Entertainment System. I am talking, of course, about the most underrated and misunderstood game EVER…Balloon Fight. The story of Balloon Fight is…to say the least…non existent. This is all that is known: You, and if need be, a companion, are to use your giant balloons to fly around in space (or at night, I’m not exactly sure) and pop your “enemies'” balloons before they pop yours. Why the denizens of this planet have split into factions and engaged in high-altitude combat is unknown to all. In addition to combating your opponents, you are to avoid such obstacles as human-flinging propellers, bouncing lighting, and a great big giant fish that very much enjoys the taste of human flesh. Apart, these enemies and obstacles do little to hinder your progress through the game…but…place them all on this tiny screen at once, and add in the ability to pop your companion’s balloons, and you have pure mayhem. And folks, pure mayhem is good. REAL good. To put quite simply, Balloon Fight is pure fun. I mean if “fun” was an actual, tangible, noun of an item, Balloon Fight would be the physical embodiment of it. Fun in its purest, rawest, primitive form. And I mean primitive. This game isn’t about graphics. One could argue that they could’ve made Balloon Fight work on the Atari 2600. However, it matters not. You don’t need graphics for pure mayhem. Graphics is just sugar. It’s a good touch, but alas, it is not necessary. And to say the least, this game needs them not. It does, however, need an ending. The game goes on infinitely. Level layouts repeat, but the speed and difficulty of the enemies and obstacles is always improving. It is certain that there is no ending because even after beating phase 99, it continues to phase A0. This basically means the next time something will change will be phase Z99, and even then there is no guarantee of an ending. Bottom line: NO ENDING. Again, it matters not. This is not a game to beat. This is a game to pop in, sit back, and enjoy a frenzy of excitement. As if the 1-2 player mode wasn’t enough to complete this cartage, a 3rd mode of play was created that basically gives Balloon Fight 40 extra points. The mode: Balloon Trip. Space. A crapload of lightning. You. That’s it. You must utilize your incredible abilities of balloon maneuvering and work your way through without getting fried. It is a great way to practice and just to have a blast with. Balloon Trip is also the only mode to actually have a soundtrack…and a damn good one at that. I mean, the bonus levels of the first 2 modes have the same music, but it is not the same. Then again, there is so much going on that music is not necessary (you probably wouldn’t even notice it was playing). I’ve read reviews. This game takes the brunt of the reviewers onslaught time and again. “Loose control” seems to be the “broken record” of their final say about the game. Ironically, the scapegoat of their grading criteria is probably what I like MOST about the game. The control of Balloon Fight is not loose…it’s unique. It feels like you are riding a balloon. You glide about the screen, always bouncing and sailing. The game has a unique feel, and to top that, a unique look and sound as well. In closing, Balloon Fight, though unsuccessful in the realm of fame and popularity, did much to improve the face of gaming. OK that’s a complete lie. This game did not contribute to the improvement of gaming. It did, however, find a place in my collection. And although unsure of how that happened, I am nonetheless glad that it did, and hope that it happens to most of you as well.